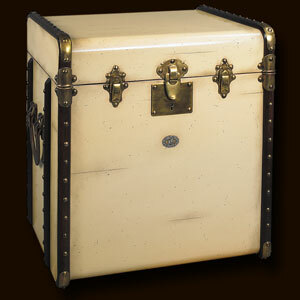 Ref: MF079 Victorian luggage was made to be shipped by horse drawn coach and train travel. It was sent ahead and handled by porters only. The tall square shape of our 'end table' trunk was made to fit more easily into tight steamer and long distance train cabins. Plus it easily swallowed a tall black stovepipe hat... The classic maple hoops strengthened by brass corners and other hardware were designed to protect against damages. Enjoy the flavor of a bygone luxury age and combine it's fin-de-siècle appeal with practical storage! M. 17.75 x 21 x 22"